As San Diego Comic-Con approaches, caravans of geeks are about to make the trek down to sunny California. If you’re like my friends’ road trips, the day will be filled with lateral thinking puzzles, Weird Al, and probably the blasting of the James Bond theme song. But what do you do when you get tired of the old options? Who gets to decide on music? 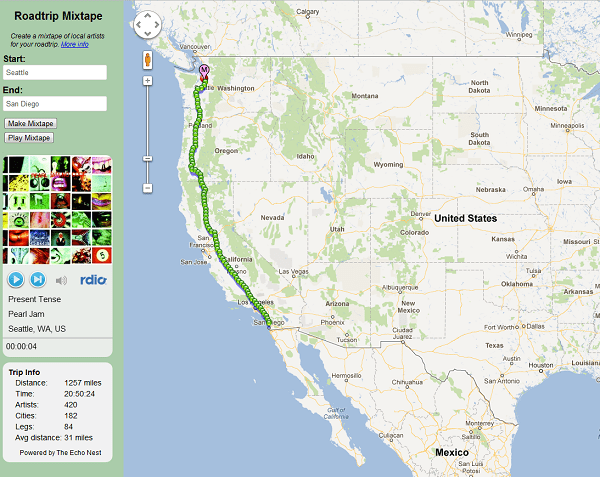 I suggest you use “Roadtrip Mixtape” by The Echo Nest. Put in your starting and ending destination, and the program will put together a mixtape of local artists from the town you are currently driving through. You’ll learn about the roots of your favorite musicians and get introduced to some local up-and-comers you may not have heard of. Not a fan of the local rapper from Renton, WA? You can skip songs to your heart’s content. How Many LEGOs to Build a House? What a smart idea! Will be facebooking this for sure!